The most complicated of the "appetizers" is the arguably #4 Pizza Soup. The dish had three components, although fortunately the mozzarella can be served directly in the form of bocconcini. The idea is a kind of deconstructed pizza. The main soup itself is tomato based, of course, derived from using both fresh plum tomatoes, and canned tomatoes (we resorted to this combination because we're not quite in the peak of tomato season yet, and I deemed the plum tomatoes I picked up merely adequate). 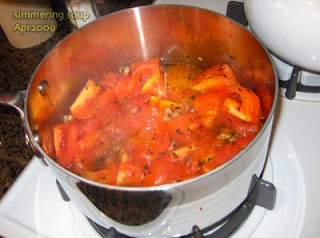 The fresh tomatoes are peeled, seeded, and then added to a saucepan which contained sizzling mustard seeds, olive oil and garlic. After cooking down a bit, a large can of crushed tomatoes was added, seasoned with dried oregano, and allowed to slow simmer for a while. Seasoning was adjusted, fried lardons of home made bacon and a healthy dose of torn basil leaves were added. For the "crust", I resorted to a high water content bread dough, and allowed it to ferment for 20 hours so that autolysis will form the gluten, and the flavor can develop. The dough was punched down, and spread into a flat shape, before being spread with olive oil, salt, and fresh rosemary. 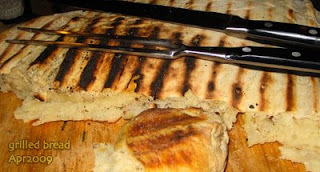 After a few minutes to rest, the dough was slid on a hot grill to seal the outer edges, flipped, and baked on the grill in indirect heat to produce this rustic bread. Crusty and toothsome, it probably has quite a bit more in common with naan bread than pizza, but the char certainly brings in the character of the dough. 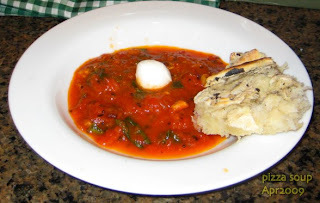 The final assembled soup consists of a ladel of soup, topped with a fresh mozzarella ball, and a hunk of the bread. We ended this portion of the meal with something that serves both as palate cleanser and "mini-dessert" - #5 Apple slaw rolls. Granny smith apples were cut into thin sticks, as was fresh pineapple, and dried cranberries, and dressed with quark (a kind of soft cheese) and honey. The slaw is wrapped in thin tapioca sheets in the same style as Vietnamese spring rolls.